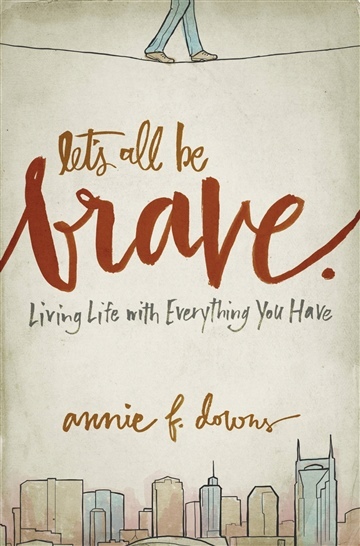 This an two-chapter excerpt from Annie's upcoming book, Let's All Be Brave, releasing July 15, 2014. Annie Downs admits she's not exactly the bravest girl in the world. She still cries sometimes when she leaves her parents' home in Georgia, she's never jumped out of a plane, and she only rides roller coasters to impress boys. But Annie knows that courage resides inside each and every one of us, and she's on a mission to triumph over her own fears while encouraging the reader to do the same. As a single young woman, writer, speaker, and blogger, Annie Downs shares her journey toward bravery with honesty and humor. Using wonderful stories from her own life, contemporary real-life examples, and fascinating historical and biblical references, Annie encourages readers to grab hold of the brave life that they desperately desire. How often does fear hold us back from the very things we most want to taste, touch, and experience? The call to be brave isn't just for one person---it's for everyone. Let's All Be Brave is more than a book, it's a battle cry. Annie challenges us to live boldly, she calls us to step into those places that require courage, and she gives us the help to take the next step forward---even when it's scary. This non-fiction, essay-driven book opens the door to many different views of courage---nudging, encouraging, and inspiring readers to be brave whenever given the chance. Let's All Be Brave features: * Funny/interesting stories that draw readers into each chapter * God's surprising answers to finding courage and boldness * Challenging questions and advice to help readers make real-life changes to live fully and glorify God more every day. Annie F. Downs is an author and speaker based in Nashville, Tennessee. Flawed but funny, she uses her writing to highlight the everyday goodness of a real and present God. Annie is the author of two books for teens: Perfectly Unique, a spiritual growth book for high school and college girls, and Speak Love, a challenge to women on how to use their words to make a difference in the world. By weaving together personal stories, humor, and Scripture, she invites the young women reading to experience fulfilled lives with a God who made them on purpose and loves them deeply. When she’s not working on books, Annie spends her days writing all over the internet- blogging at AnnieBlogs.com and (in)courage- sharing truths about her life in Nashville as a single Christian woman and the stories that are woven into each day. Annie also loves traveling around the country speaking to young women as a Girls of Grace speaker as well as at other retreats and events. Annie is a huge fan of singer/songwriters, burritos, her community of friends, and sports of all kinds. "Annie Downs is a comedic artist, a relational genius, and basically one of the bravest women I know. Her words sound like friendship and feel like courage, offering hope for those of us who want to live free instead of scared. Let's All Be Brave is fresh, relatable, and life-giving -- her best book yet." "For years I've said that part of our job is to be brave and go first so that we give other people the gift of going second. In this book, Annie did exactly that. It's your turn now." --- Jon Acuff, New York Times Bestselling author of Start.